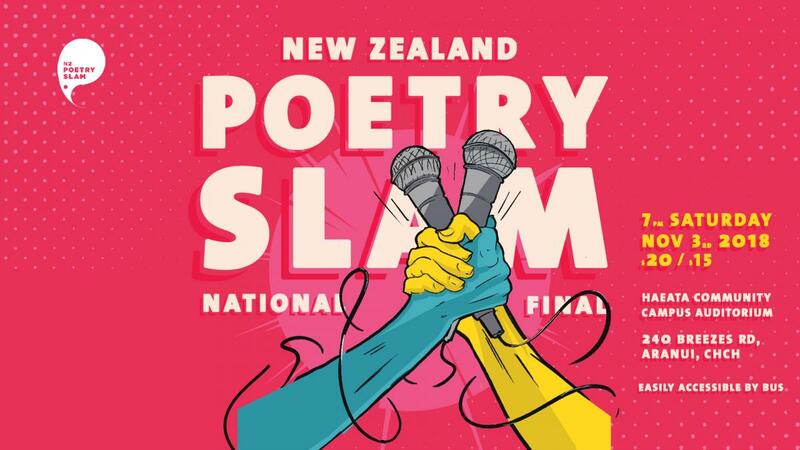 New Zealand Poetry Slam proudly presents the 2018 NZ National Poetry Slam Finals. The top poets from across Aotearoa have been battling it out in their own cities for a chance to compete at the National Finals. Now, the best performance poets in the country will perform in Christchurch for a chance to be crowned 2018 National Poetry Slam Champion. Since 2011, Aotearoa’s National Poetry Slam competition has gathered the winners of regional events to crown a Champion but this is the first time the event will take place on the South Island. Regions sending competitors to battle it out are Auckland, Hawke’s Bay, Wellington, Nelson, Christchurch, Dunedin and Queenstown. The event will also feature a special performance by Christchurch Poet and current New Zealand Slam Champ Daisy Lavea-Timo. Daisy has taught English at Cashmere High School, performs at corporate events, and runs Spoken Word Poetry workshops in schools, youth groups, community organizations and detention centers. She knows words have the power to explore who we are, where we come from, to make sense of the world around us, to heal and describe the future we want to create. Come experience the most electric, hilarious, and powerful spoken stories in the country. The Top 12 will compete in three rounds of competition and their fates are in the hands of the audience: five random audience members will be chosen to determine the winner of cash prizes and bragging rights as the 2018 National Poetry Slam Champion.